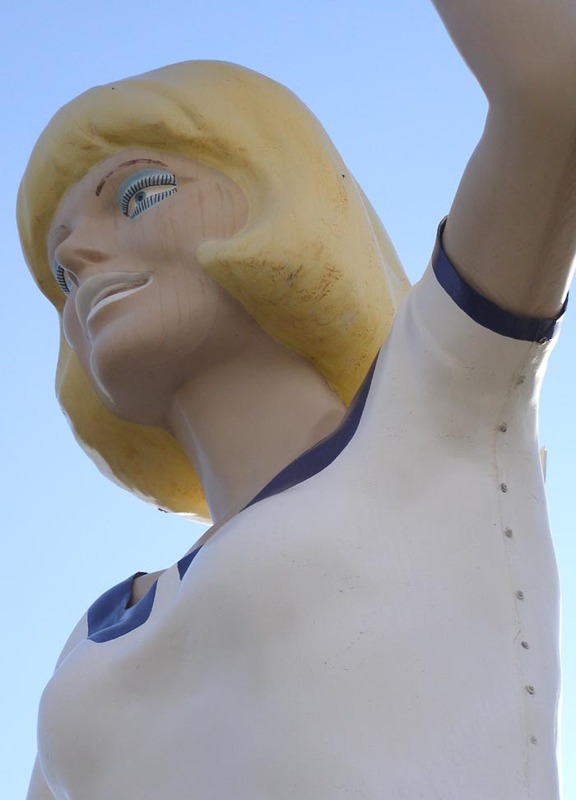 These 18 foot tall statues were produced in the 1960s by International Fiberglass for the Uniroyal Tire & Rubber Company. 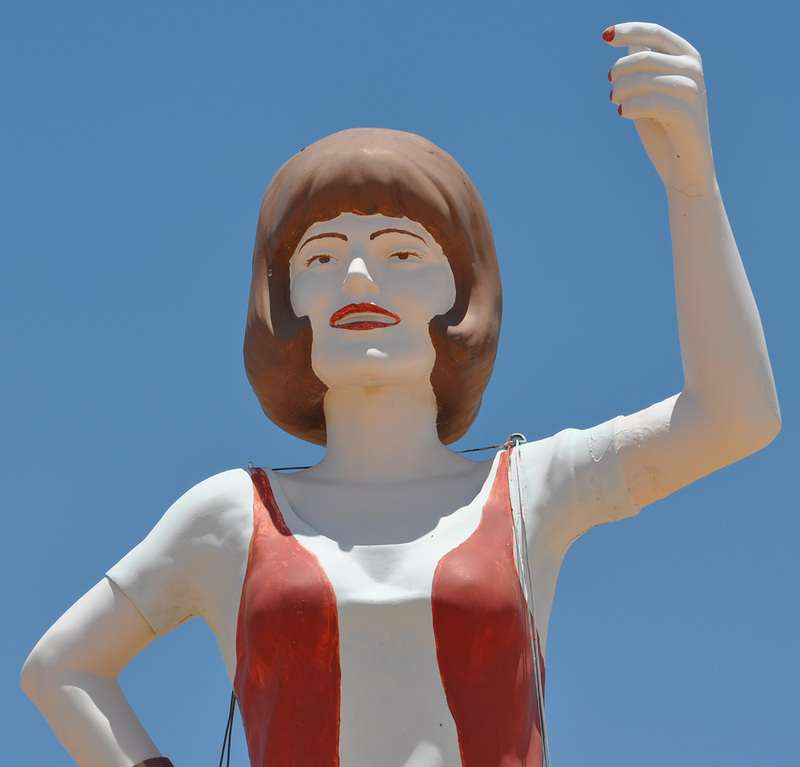 The company called this statue "Miss Uniroyal." 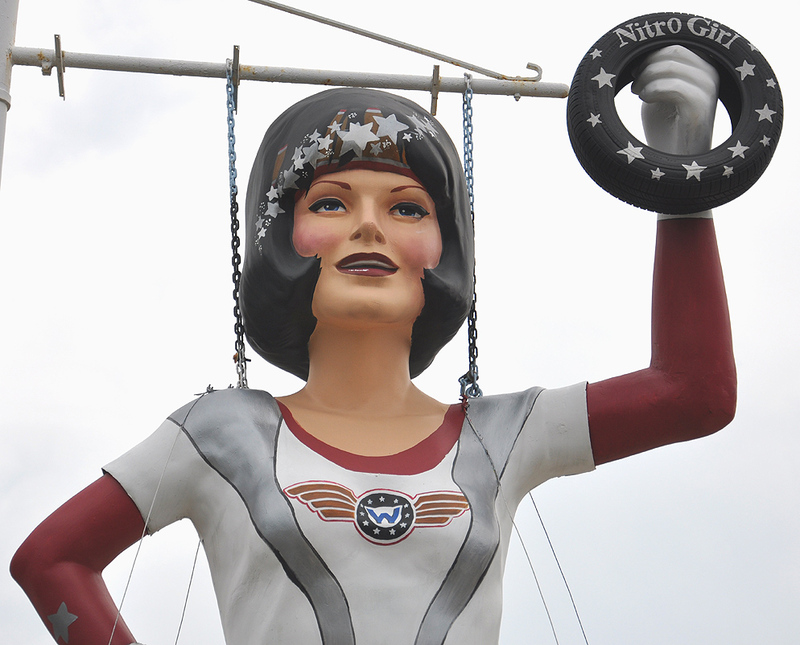 These statues were originally moved around to different Uniroyal tire stores and gas stations for promotions and events. 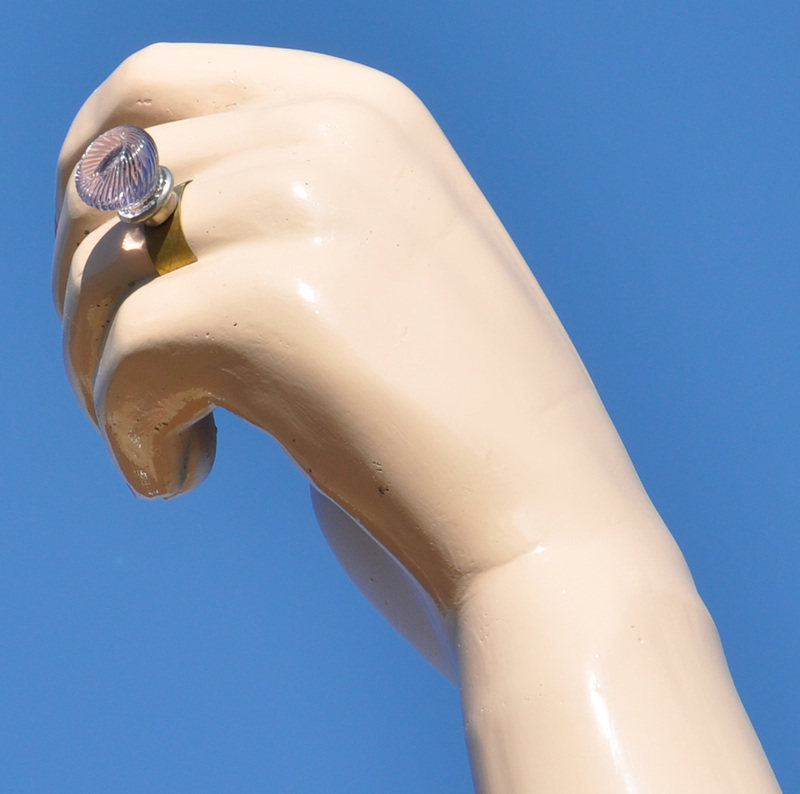 The Miss Uniroyal statue held a Uniroyal Tire sign in her raised left hand and wore a watch on her right wrist. These statues were all produced wearing a bikini. 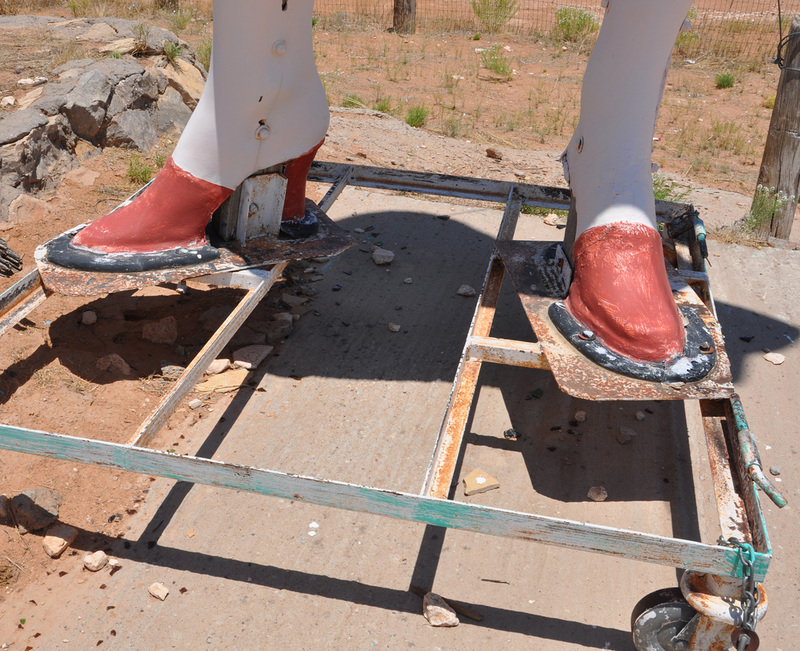 According to one source, Uniroyal received many complaints that the statues were too racy. 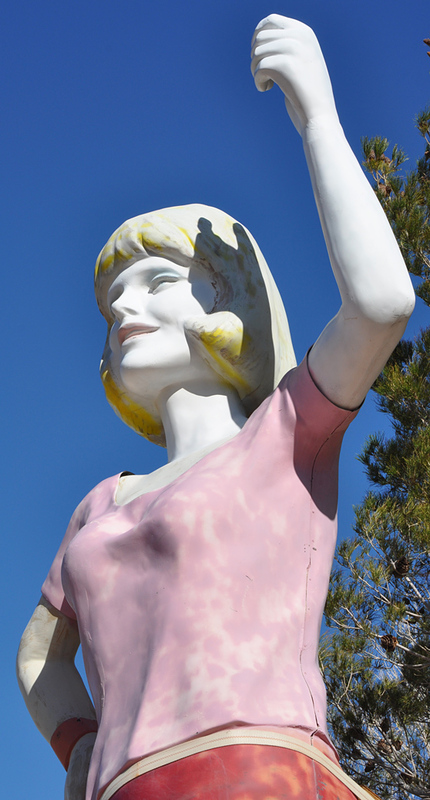 The statues were all sent back to International Fiberglass for add-on skirts and blouses. 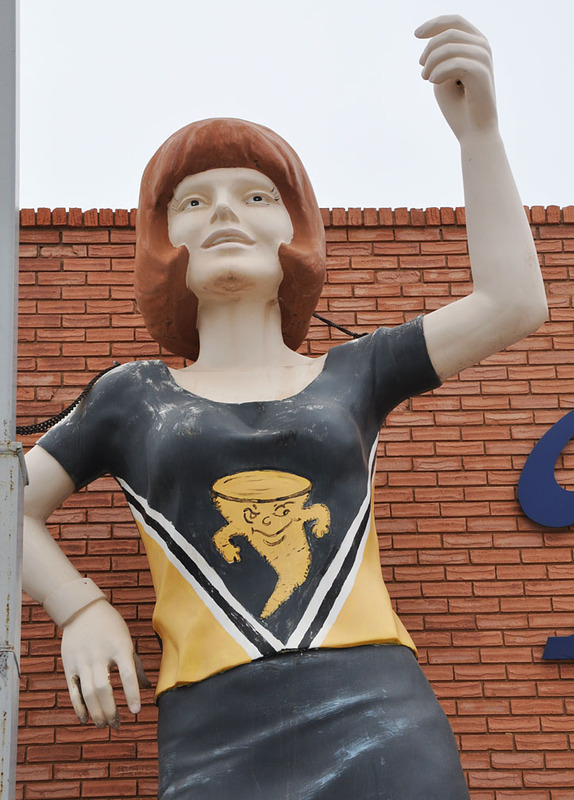 Tire stores could also purchase the statues directly from Uniroyal. 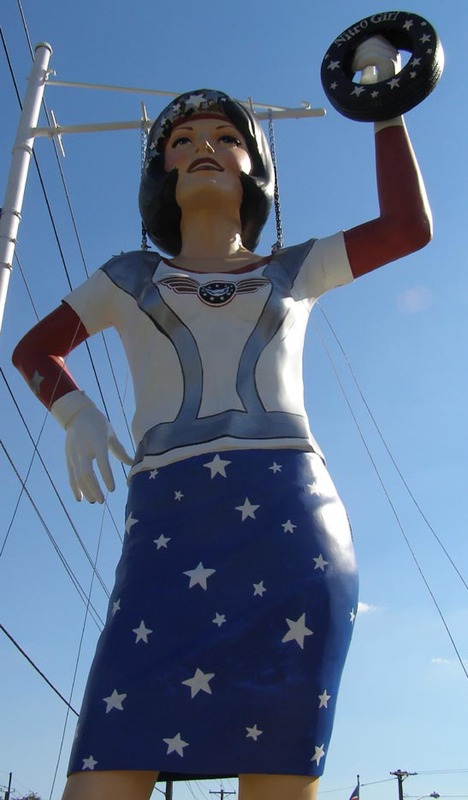 Since there was no exclusive contract with Uniroyal, International Fiberglass began marketing these statues themselves as their "Miss America" model. It is not known how many were produced but there are 15 known to have survived. Over the years, as businesses closed, these statues have been moved around and adapted for many different types of businesses. Evidently, at least one mold found its way to North Carolina or one was made from one of these statues. 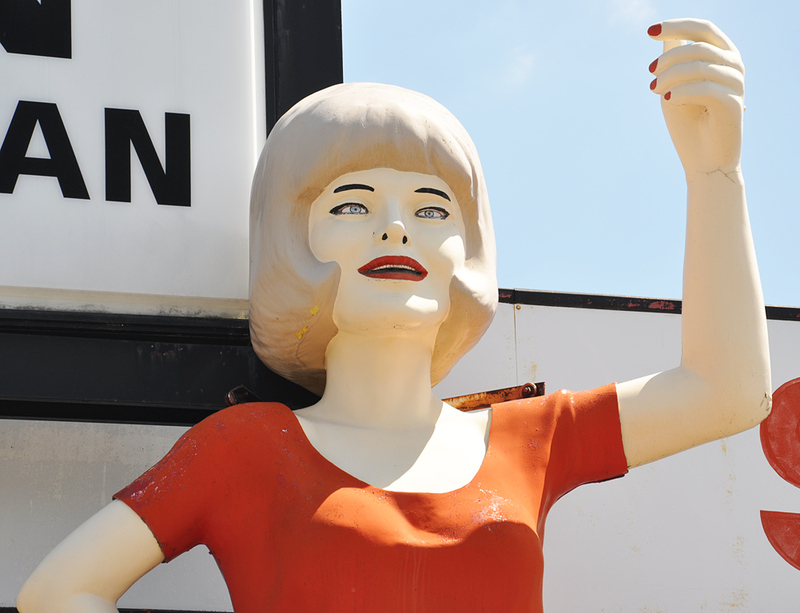 The mold was apparently produced or used by Unique Fiberglass Figures in Rocky Mount, NC. 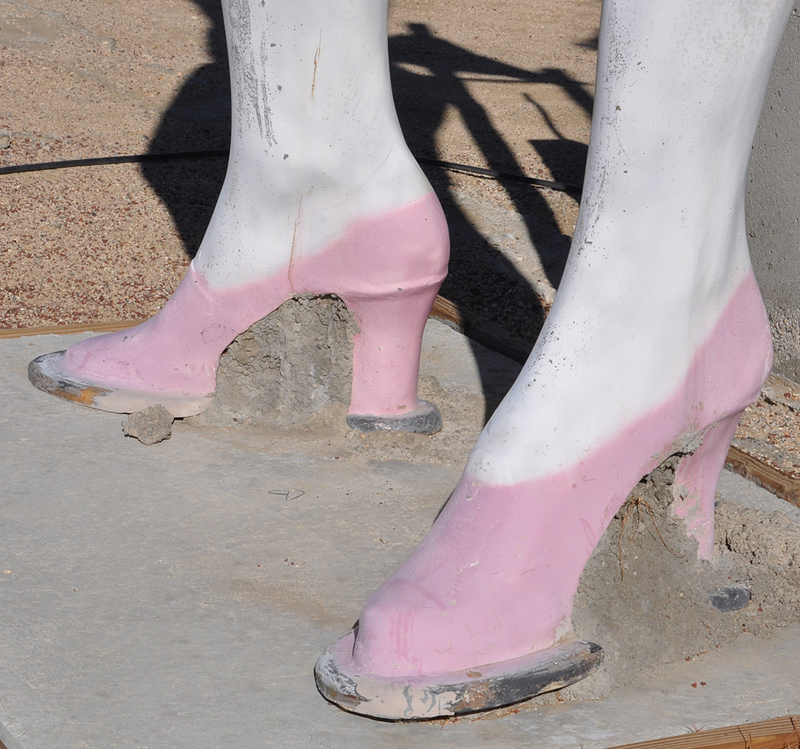 A few Miss Uniroyal statues have been produced in Bolton, NC from this mold. 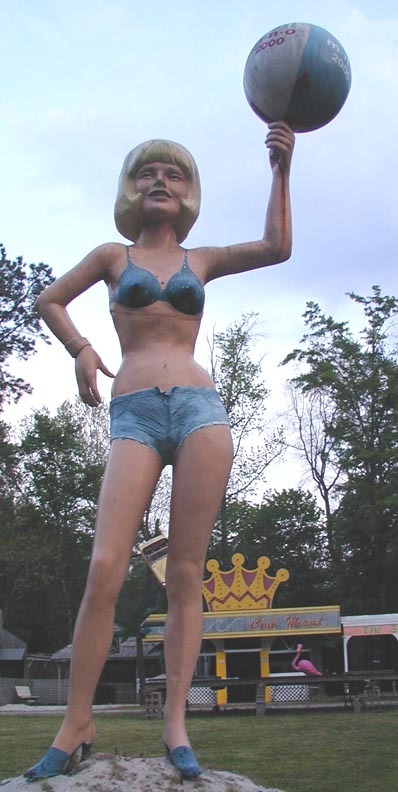 This Miss Uniroyal statue was originally installed at a gas station in Mount Vernon, IL. 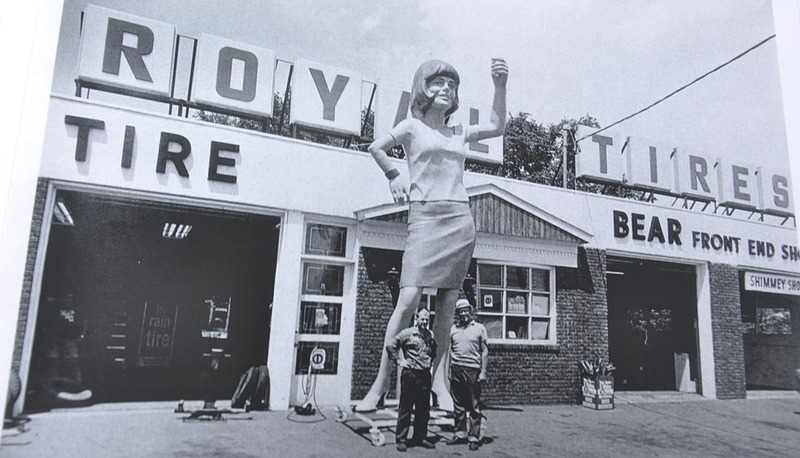 Around 1971, the statue was purchased by Stan the Tire Man and installed next to the store. 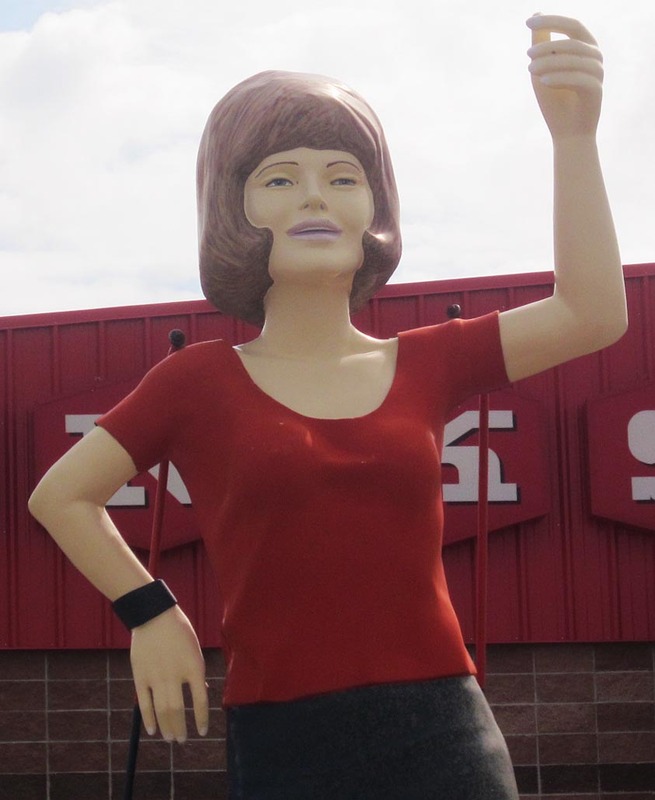 The tire store already had an International Fiberglass Paul Bunyan statue. 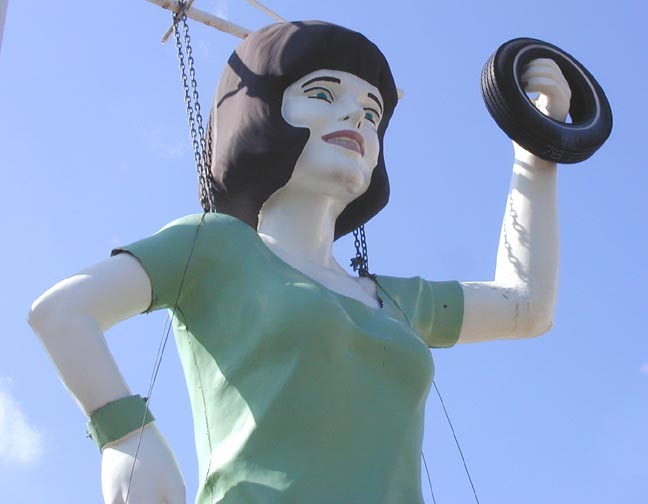 The Paul Bunyan was later moved to the Stan the Tire Man store in Salem, IL. That statue is now located in Rocky Mount, NC. 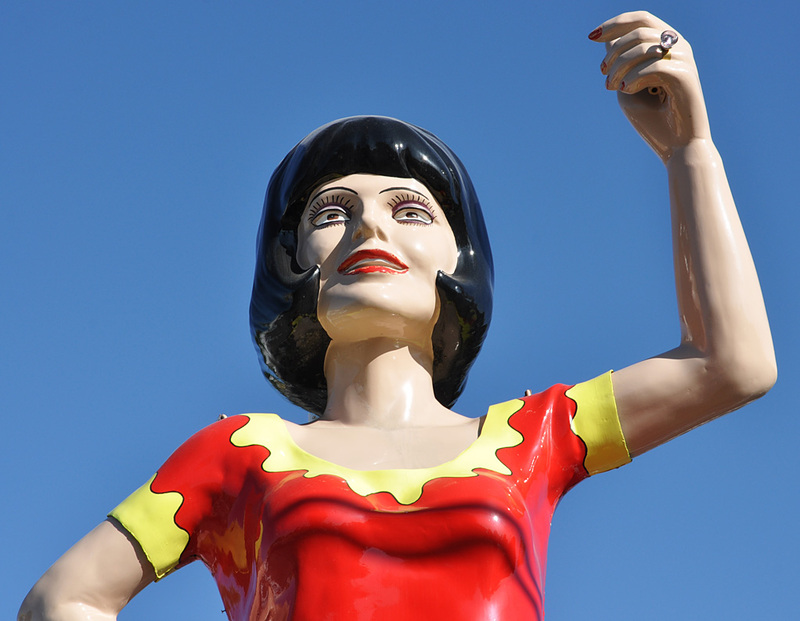 This Miss Uniroyal statue in Rocky Mount stood for many years at Mosley's Shady Lake Motel in Rocky Mount. In 2000, she was moved to Men's Night Out, a private men's club. She held a beach ball at the motel. 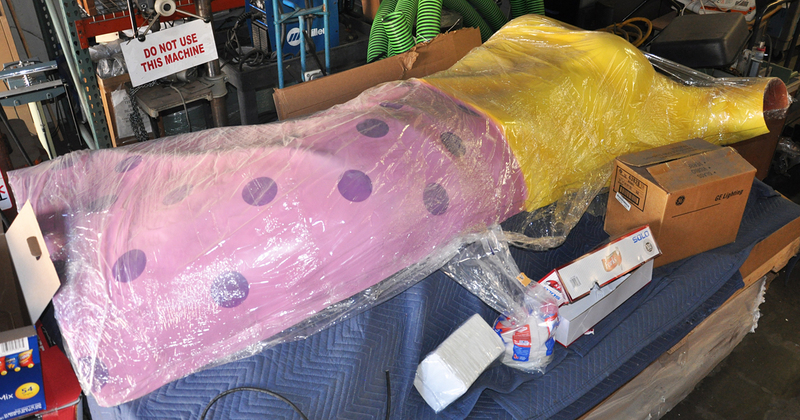 When she was moved, her bikini bottom became hot pants and she went from a brunette to a blonde. She also acquired a belly ring. That feature is now missing. For more, see this website.